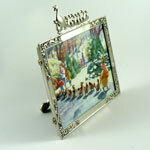 This fine pewter frame is made in the United States by American craftsmen. The process to individually cast, chase, finish and patina each fine design is completely by hand, in the old world way, avoiding the use of modern machinery and devices which impart their mechanical nature to the work of today's large foundries. The frames use only the finest and purest metals from around the world to achieve the world's finest pewter and to insure the continuous integrity. One of the key ingredients in the pewter formula is the alloying in to the Elias Fine Pewter of a small amount of pure sterling silver which helps all the other fine elements to work in perfect harmony. Stands up on a surface by means of a sturdy pewter support. Dimensions: 3 1/4" x 4".